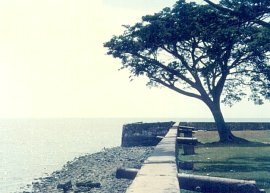 Kuala Kedah Fort (Kota Kuala Kedah) is situated at the mouth of the Kedah river, less than 10 kn from Kedah's capital Alor Setar. Rectangular in shape, its sits on the northern bank of the river, with its west wall facing the Straits of Melaka, the south wall overlooking the river towards the town of Kuala Kedah, the north wall facing a thick mass of mangrove swamps and the east wall facing a small fishing village and padi fields. Surrounding the landward facing walls is a water-filled moat, known locally as Alor Melaka. While it was still a functioning military outpost, it housed buildings for a royal palace, guard houses, canteens, an arsenal and numerous thatched huts where they soldiers lived. 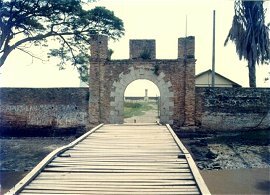 A drawbridge at the main gate spanned the Alor Melaka on the east side. It was ringed with brass cannons on all sides except the wall facing the mangrove swamps. It is ironic that a fort that was to become the scene of so many last ditch struggles for Kedah's independence, actually began life as an outpost for the Malay Peninsula's first Western colonizers - the Portuguese. 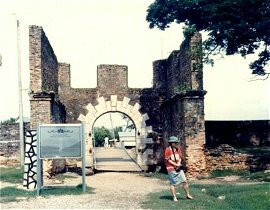 Formerly called Kuala Bahang and the fort was built during the reign of Sultan Sulaiman of Kedah (1602-1619) with the help of the Portuguese. Its very rectangular shape indicates that it probably served more as a trading factory for use by the Portuguese rather than a military fortification designed with bastions, strong points and fields of fire. 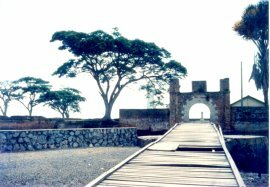 Nevertheless, being an outpost occupied by the Portuguese, it certainly became a target for their main adversary during the period - Acheh. The Achehnese Sultan Mahkota Alam attacked the fort in 1619, expelling the Portuguese from the fort. Mahkota Alam went on to conquer the rest of the State, bringing back with him over 7000 captives to Acheh, including the unfortunate Sultan. 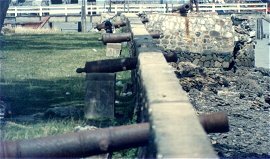 Kedah purchased over 30 cannon from the Portuguese in 1650, some of which were used to strengthen Kota Kuala Kedah's defences. These were to indeed prove useful during the Bugis period of dominance in the next century. The Bugis leader Daeng Parani, with a strong force of 62 war boats from Riau and Selangor, invaded Kedah in 1724 and took an active part in the power struggle between Sultan Muhammad Jiwa and the Sultan's younger brother who was plotting to overthrow him. Daeng Parani sided with the ruling Sultan, while the Sultan's younger brother invited Raja Kechil and his Minangkabau followers to oust the Bugis from Kedah. Raja Kechil occupied Kota Kuala Kedah but another fleet of warboats led by Daeng Parani's brother, Daeng Merewah, succeeded in driving Raja Kechil and his forces out of Kedah back to Siak. The war lasted two years and devastated Kedah. The Bugis were again playing kingmakers when, in 1771, they supported dissident forces in Kedah out to depose the ruling Sultan Abdullah Mukarram Shah. 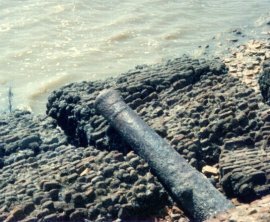 They captured Kota Kuala Kedah that year and it is said they seized over 300 brass cannons of all calibres in the battle. However, the Sultan obtained the help of the English trader-adventurer Captain Francis Light, who re-captured the fort for the Sultan and used it as a base. In return, Light promised to use the fort to protect the Sultan from any attacks that might take place from the Kedah river estuary. It was probably this promise that led the Sultan to believe for so long that English would provide him with military aid against his enemies - in particular his overlords the Siamese. This promise that was never kept. The fort had earlier been constructed of hardened clay and earthworks, reinforced with stout timber beams. In 1771, Sultan Abdullah decided to strengthen it further - particularly to take into account the much larger calibre cannon now being used by his adversaries the Bugis and the Siamese, as well as the new siege tactics of the time. Its walls were made stouter with stonework and brickwork and incorporated 'modern' features such as parapets and peepholes for firing muskets. The cannon were also replaced with bigger calibre guns purchased from the English, Dutch, Achehnese, Minangkabaus and Brunei Malays. Construction was finally completed in 1780. Earlier fears of the Siamese was realized when, at noon on Sunday November 12th, 1821, a large fleet from Siam sailed into Kuala Kedah. Not knowing their intentions, the Siamese were welcomed with great ceremony when they landed by the fort commander Bendahara Dato' Paduka Maharaja Sura. While being lead around for a tour of the fort, the Thai commander, the Raja of Ligor, Phya Buri Sakmuton, suddenly ordered his men to attack. Taken completely by surprise, the garrison was massacred. The Sultan fled to Penang and, from there, planned a war of resistance to the Siamese. In 1831, the Sultan's son Tunku Kudin led 3000 Malays out of Prai and drove the Siamese from Kedah. However, facing a Siamese army of 7,500 men and 3,000 elephants, Ku Din was driven back and cornered in Kuala Kedah fort with only a few hundred men. The Siamese could not breach the fort's stout walls and had to build wooden siege towers overlooking the fort, from which they released murderous musket fire upon the defenders. After a bloody siege lasting three months, the fort was stormed and Ku Din's head was sent to Bangkok. Another Malay attack in 1838 not only won them their homeland again but even managed to take the war to Siamese territory, allowing them to liberate Patani and besiege Singora (Songkhla). But as before, heavy reinforcements arrived from Bangkok and the Kedah Malays made one final last stand at Kota Kuala Kedah. Two hundred men held out to the end, surrounded on land by 15,000 Siamese infantry equipped with modern muskets, artillery and elephants. 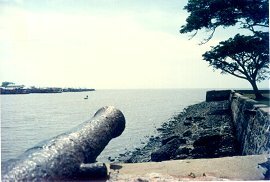 At sea, the British 18-gun warship 'Hyacinth' and three gunboats blockaded the fort. After terrible massacres and atrocities on both sides, the defenders were overwhelmed and triumphant Siamese captured the fort in the early hours of March 20th. 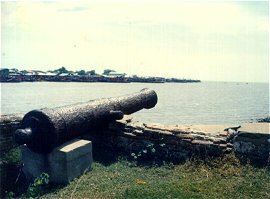 That last stand of the Kedah's independence also marked the last time ever Kota Kuala Kedah cannon's were fired in anger.